Back in 2012 when Samsung took the crown for the biggest shipments in smartphone market from Nokia, it established itself as a brand to be reckoned with. The South-Korean electronics manufacturer received similar response both in terms of sales and popularity as Nokia and it thrived. Until Xiaomi entered India in 2014 with the Mi 3 and ruined Samsung&apos;s party. In January 2019, Xiaomi trumped Samsung to become the smartphone company to ship the most number of smartphones in India. It is not a secret that Samsung was struggling in the mid-range smartphone market after Xiaomi unleashed a bunch of really smart smartphones! After waiting it out in the wild, Samsung has come up with their latest take on a modern budget smartphone, the Samsung Galaxy M20 which will be going up against the likes of Redmi Note 6 Pro, the undisputed king of mid-rangers. The Galaxy M20 is one of the first phones in the M-series that made its debut in India which is why it is an important statement from Samsung in itself. Let&apos;s see how this goes. The Redmi Note 6 Pro comes in two variants- 4GB RAM/64GB storage at Rs 13,999 and 6GB RAM/64GB storage at Rs 15,999. It is available on Flipkart and Mi store India. Samsung Galaxy M20 starts at Rs 10,990 for the variant with 3GB RAM and 32GB storage while buyers will have to shell out Rs 12,990 for 4GB RAM and 64GB storage. Here, Samsung has a much affordable option in the base variant which could draw in takers who are on a strict Rs 10,000 budget. Having said that, the real competition is between the 4GB RAM variants where Samsung is again able to undercut Xiaomi by over Rs 1,000. Xiaomi also has a variant with 6GB RAM which is priced at Rs 15,999 and there&apos;s no official information from Samsung about a 6GB variant for the Galaxy M20. With that out of the way, here&apos;s how both the smartphones actually feel in the hands. Picking up the Galaxy M20, I was reminded of my encounter with the company&apos;s first Android Go smartphone, the J2 Core. The chassis is made out of polycarbonate and curves around the edges to accommodate the display. It weighs around 186 g and is 2.93-inches in width. On the other end of the spectrum is the Redmi Note 6 Pro with its metal construction weighing around 181 g making it fairly lightweight than the Galaxy M20. In terms of handling, both kind of builds come with their pros and cons. Xiaomi hasn&apos;t tinkered around much with the fundamental design that we see most of the Xiaomi phones acquire. From someone who gets access to these smartphones than a usual buyer, the design of Redmi Note 6 looks overused now. But hey, it works, so we shouldn&apos;t complain. The Galaxy M20 however, is an all plastic build. It doesn&apos;t have that matte finish on the back and makes us do with a glossy rear panel instead which is a smudge magnet. Due to the polycarbonate nature of the build, it will be accustomed to scratches and dents more than the Note 6 Pro. The M20 is also a bit narrower than the Note 6 Pro which makes for an easy grip for people with big hands. The extra heft seem to balance out evenly across the body giving it a solid feel in hand. The same cannot be said for the Note 6 Pro which is a bit slippery due to its all-metal built and a slimmer profile. To say that the Galaxy M20 doesn&apos;t match up to the design standards of this budget segment would be too much. It is a differently designed smartphone which is makes it a potential option for buyers to consider just like the Redmi Note 6 Pro. Samsung has finally made its terms with the notch and the Galaxy M20 is the first example of the company adopting the notch design on their smartphones. Samsung revealed the different notch-design that they were working on back during their developers conference and the Galaxy M20 is just one in a long list of Samsung smartphones that will feature notch on the front in 2019. The M20 features a 6.3-inch Full HD+ (2340 x 1080 pixels) IPS display which has a 19.5:9 aspect ratio due to the infinity-v notch. This is your run-of-the-mill waterdrop notch which allows for 83% screen-to-body ratio giving us more screen estate to play around with. The Note 6 Pro has the original notch design on the front with a screen measuring 6.26-inches diagonally. The IPS panel has a Full HD+ (2280 x 1080 pixels) resolution with around 81% screen-to-body ratio and a 19:9 aspect ratio. The screen is topped by a 2.5D Corning&apos;s Gorilla Glass panel which offers more protection to the display than usual. The same isn&apos;t present on the Galaxy M20. In regular usage, the screen on the Galaxy M20 looks more appealing to the eye. A lot of this can be credited to how the screen blends into the UI efficiently. Samsung has also been able to narrow out the bezels even further resulting in sleek bezels. The chin is also narrower than that of the Note 6 Pro. This is something that Samsung brings in with its years of experience of manufacturing panels. 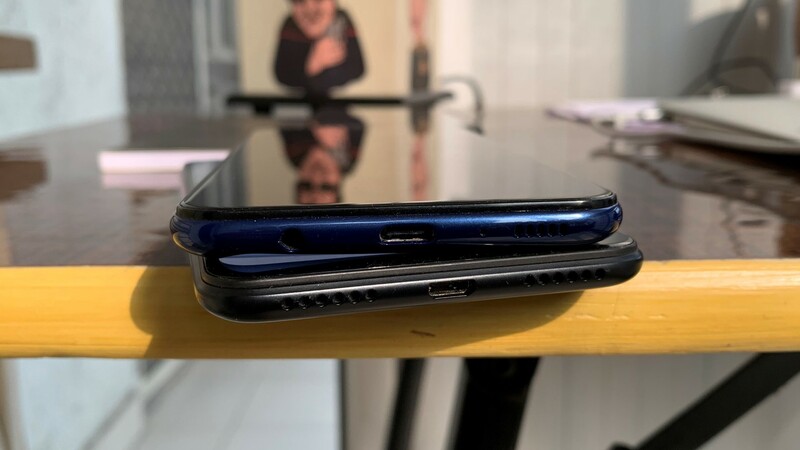 The screen on the Galaxy M20 is in its real sense able to provide a full view experience and this can be observed just by looking at the two phones. The OG notch has lost its charm hasn&apos;t it? That&apos;s not to say that the display panel on the M20 is by any means better than the one on the Redmi Note 6 Pro. Both the phones edge out each other in a couple of ways. With Note 6 Pro, there&apos;s a very soft light-blue tint on the screen which is why colors look soft and a bit dull in comparison to the Galaxy M20. But, the pictures and videos on the Note 6 Pro look a bit more crisp than on the Galaxy M20. Then again, visually, the M20&apos;s screen looks a lot better due to the small notch. So, it really here and there if I may say so. From a content consumer perspective, both the phones have a really good display, it is the visual experience which differs due to the different types of notch. Dual cameras on both the phones allow for a good photography experience and enthusiasts should keep these two in mind. The setup on M20 consists of a primary 13MP snapper with an f/1.9 aperture and 1.12 micron sensor. It supports PDAF and is assisted by a single LED flash. There&apos;s a 12MP primary camera on the Note 6 Pro with an aperture of f/1.9 and a sensor size of 1.4 micron. In daylight, M20&apos;s camera produces images that are well exposed, with details but more saturated. The Note 6 Pro on the other hand, produces fairly good detailed pictures that have natural colours. On the M20, pictures were often saturated, with slightly more contrast and brightness. The images from the Note 6 Pro are less detailed but manage to maintain colour accuracy, white balance and exposure. At night, the camera on the Note 6 Pro shines as it is able to capture more details in the scene albeit with a lot of noise. There were times when a lot of the shots were overexposed which is an indication of the sensor feeding off of light, a bit more than usual. The autofocus is snappy. It has a learning curve which is really good for photographers to play around with. Both the phones sport a 5MP secondary camera, the one on the M20 has f/2.2 aperture with a wide-angle lens that captures upto 120-degree more scene in the camera. It is this capability which should attract photography enthusiasts. The M20 is able to create some really good-looking wide-angled imagery which is a plus for any smartphone in our books. Redmi Note 6 Pro&apos;s secondary 5MP camera assists in depth sensing to create pictures with a depth-of-field effect. The camera is able to nail this part as the portrait mode pictures from it look natural, detailed with exposure well under control. It is also able to retain blacks in direct sunlight which in the case of M20, just blows it out of the water with exposure. Front cameras on the Note 6 Pro ace against the M20 as they are able to create pictures that are much more detailed, with natural colours and good white balance. The M20 just doesn&apos;t seem upto the job, beauty mode on or off. Both the cameras are fairly advanced in the budget and with the list of pros and cons above, they shine in some or the other aspect. While one could live with a less detailed picture that is more naturally accurate, others might be put off due to the little difference in detail retention. Similarly, the colour representation on pictures from the Galaxy M20&apos;s camera doesn&apos;t really do justice to the eye and might be a downside for some. First lets start with how both the Galaxy M20 and Redmi Note 6 Pro fare on paper. The M20 is powered by Exynos 7904 chipset with an octa-core CPU and Mali-G71 MP2 graphics processor. Two Cortex-A73 clusters for high-demanding tasks clocked at 1.8GHz and six Cortex-A53 power-efficient cores, each at 1.6GHz make up the CPU. In competition, the Qualcomm Snapdragon 636 has almost become like the standard offering on mid-range smartphones. The SD 636 is fabricated on a 14nm architecture process just like the Exynos 7904. It&apos;s octa-core CPU consists of four performance and four power-efficient cores. The Kryo 260 is based on Cortex-A73 and Cortex-A53 cores but is a little more powerful and hence makes the Galaxy M20 lag behind. Couple that with the fact that the RAM capacity tops out at 4GB, there&apos;s little that can be done to improve performance. The CPU on the Redmi Note 6 Pro can take on the Galaxy M20 with using less than 30% of its total running capacity. That difference can easily be spotted in the benchmark scores of both the phones. The Galaxy M20 scored 109220 points on AnTuTu benchmark while Geekbench 4 awarded it 1320 points on single-core and 4087 points on multi-core performance. Whereas, Redmi Note 6 scored 1337 points on single-core and 4903 points on multi-core performance test of Geekbench 4. On AnTuTu, The Note 6 Pro scored 116257 points. There are a couple of things that went wrong for the Galaxy M20. Even the graphics processor on the Galaxy M20 is dated now and can in no way match the graphics performance to that on the Redmi Note 6 Pro. We played a couple of round of PUBG Mobile and gameplay on the Note 6 Pro superseded that of the Galaxy M20. Multi-tasking on the Galaxy M20 feels a lot more slower in comparison to the Note 6 Pro, otherwise it runs apps in a breeze. The waterdrop notch is comparatively smaller than the regular one on the Note 6 Pro hence, Samsung is able to take the edge with a larger screen. Google&apos;s Android 8.1 Oreo runs on both the smartphones with their fair share of customization. The Galaxy M20 returns with the Experience 9.5 UI while the Redmi Note 6 Pro has its MIUI 10 skin. We have to say, the UI on the M20 looks more appealing and fresh. This is also due to the smaller notch and a visually large screen estate with thin bezels. The UI blends into the screen and overall feels more like a part of the phone. Animations in Samsung&apos;s Experience 9.5 UI feel a lot more natural however are marred by frame drops and lags. Blame Samsung for not using a better processor and even a bumped up RAM, but this is what they&apos;re offering. In regular use, the Note 6 Pro has a much optimized user interface which allows for faster operations and speed, something that the M20 lacks. The Note 6 Pro takes every advantage of the Snapdragon 636 and that just shows. The advantage of a bigger 5,000mAh battery is quite obvious, every unit counts, right? Samsung is able to offer a 1000mAh more than what is present on the Redmi Note 6 Pro. In our day worth of heavy usage consisting of activities like browsing the internet, going through Facebook feeds, playing a round or two of PUBG, watching YouTube videos; the Galaxy M20 was left with 26% charge while the Note 6 Pro still had 34% juice in it. The interesting thing here was that both the phones were showing an estimated battery life remaining that was quite close. With the same usage pattern the M20 was going to last for 13 hours while the Note 6 Pro would die down in 12 hours 49 minutes. The bigger capacity battery does come into play here. In our battery tests, the M20 on an average showed a 12% dip in battery over the course of an hour. The Note 6 Pro had an average of around 14%, which is close but falls 1000mAh short. For buyers, the thing to keep in mind is that while the M20 has a bigger battery, it doesn&apos;t translate to a good overall performance which the Note 6 Pro is able to provide. If one plainly wants a longer lasting battery, sure they can blindly go ahead with the M20, but that comes at an expense which is something they should be aware of. 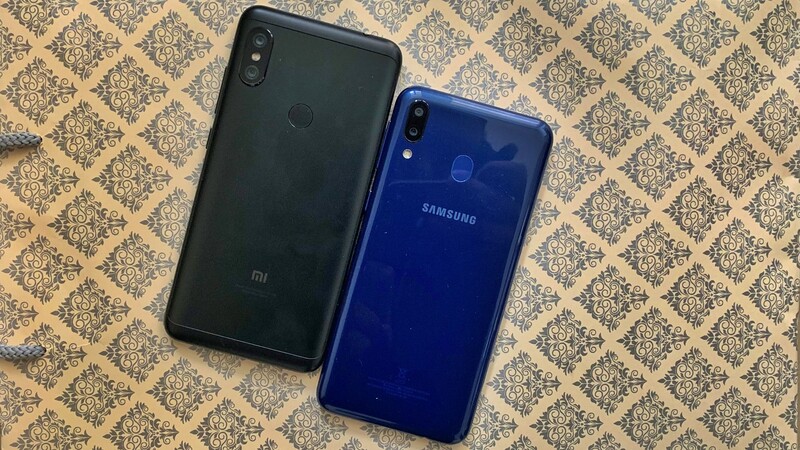 The Samsung Galaxy M20 comes at a time when people have been too much used to Xiaomi&apos;s offerings. Surely it doesn&apos;t come with sweets in hand but instead challenges the king. The usurper, M20 is priced in a very sweet spot between the different variants of the Note 6 Pro and almost wants all of you to look at it. While the performance of the Note 6 Pro is unmatched, there are a couple of things that the Galaxy M20 does right like the fresh design, waterdrop notch, a big battery and a good camera. Users who are out in the market looking for a new smartphone in budget ranging from Rs 10,000 to Rs 15,000 could get either of these smartphones. While the 6GB RAM variant of the Redmi Note 6 Pro is for power users, there is just a difference of Rs 1,000 in the top variant of the M20 and the base variant of the Note 6 Pro. If you&apos;re a sucker for performance, less lags and smooth user experience, the Redmi Note 6 Pro is what you should choose. On the contrary, if users are looking for something different than the usual Xiaomi phones, Samsung Galaxy M20 makes for a worth competitor.